We've written previously about Intel's Optane cards - why to consider them, what workloads they're suited for, and how to get the most out of them with VMware. Today we'll share some initial results from our lab testing with Optane. As a reminder, there are a few reasons why Infinio's server-side cache is the best way to deliver Optane performance to any VMware environment - whether you're running SAN, NAS, DAS, or HCI. You can keep using your existing hardware platform, along with its enterprise storage features, like snapshots, replication, backups, and reporting. A larger number of VMs can benefit from Optane because only hot data is stored in cache (rather than entire VMs). 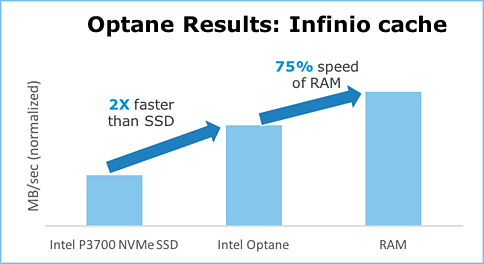 Infinio dynamically identifies the data that is the hottest and stores it in the cache, ensuring that the Optane is being deployed where it can provide the most performance benefit. On to the lab tests: In our lab, we set out to determine how Optane compared to both RAM and to a classic SSD. Running FIO, we tested with three sets of configurations: a purely RAM-based cache, a minimum amount of RAM and an Optane-based cache, and a minimum amount of RAM and an Intel P3700 cache. We ran across a variety of read/write ratios, block sizes, and queue depths, and the results were reasonably consistent across these variables. Over all these tests, the Optane-based cache was between 150% and 200% the speed of the SSD-based cache. The Optane-based cache was between 60-80% of the RAM-based cache. Clearly, this can be a valuable tier of performance that is not as expensive as RAM, but provides better performance than a classic NVMe SSD. Infinio is listed on VMware's HCL and is certified VMware Ready. With a 15-minute installation, you can download the software and get started today.